The village of Ridgewood is a sleepy suburb located approximately 20 miles northwest of Midtown Manhattan. With its picturesque surroundings and small-town feel, this Bergen County village was ranked 26th in Money magazine’s “Best Places to Live in America”! Whether you are a professional commuting to New York City or a family looking to settle into a safe residential community, Ridgewood, New Jersey is a great place to live! If you are ready to plan your Ridgewood relocation, then look no further than Booth Movers for the best in Ridgewood moving services! Since 1945, our award-winning Ridgewood movers have been providing expert local, long-distance, and international moving services at affordable prices. Whether you are moving down the street or across the country, Booth Movers is the most trusted name among Ridgewood moving companies! Our Ridgewood moving company is committed to quality service and customer care. As a certified ProMover and proud agent of Atlas Van Lines, our Ridgewood movers are connected with a global network of moving and storage professionals that can complete residential relocations of any size. 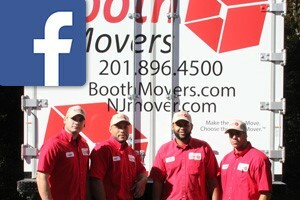 Wherever life takes you, you can count on Booth Movers for the best in Ridgewood moving services! For more information on the professional services our experienced Ridgewood movers provide, see the links below! Residential Moving – For a residential relocation of any size or scope, our Ridgewood moving company offers customizable services to suit your needs. Household Moving – From basic transport to full-service household moving, no job is too big or too small for our Ridgewood movers! Local Moving – When relocating within the Bergen County region, nobody knows the area better than the experts at Booth Movers! Long-Distance Moving – Make planning your long-distance relocation a breeze by letting Booth Movers handle all the details! Interstate Moving – When you are moving to a new state, our Ridgewood moving company will ensure that the entire process is a seamless experience. Full-Service Moving – Booth Movers offers full-service packing and moving services to help take the stress out of your next move! International Moving – Our unmatched global moving team will guide you through each stage of the international moving experience. Ready to learn more about the expert Ridgewood moving services that Booth Movers offers? Give us a call today, or fill out our online form today to request your free moving estimate!